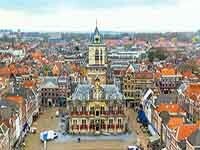 Delft is not just a city, it's a whole open-air museum. Most of the buildings in the central part of the city since the 17 century. Delft I also call the "absolute center" of the Netherlands, since the city is geographically located between The Hague and Leiden.